If you’ve yet to experience the wonders of shopping in Santa Fe, then you in for an exquisite treat. 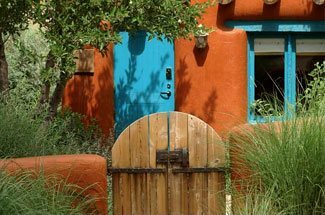 Here, you’ll find a wonderful assortment of boutiques, independently owned shops, and open air markets that are as unique and different as the city of Santa Fe itself. Historically, Santa Fe was a major trade thoroughfare, bringing luxury goods to and from the American Southwest along the Santa Fe Trail. Today, you’ll find a thoroughly modern city that has maintained this link to its rich past, still bringing shoppers an unprecedented variety of high quality Native American Art and other unique, handmade goods only found in Santa Fe. 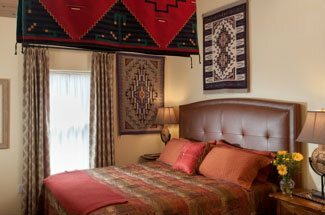 Book your room at our luxury Santa Fe Bed and Breakfast today, and enjoy your shopping spree around this tasteful city. We think one of the most enjoyable activities when on vacation, especially in a city as vibrant of Santa Fe, is browsing through the many shops encountered along the way. Though there are large shopping centers here, the commonplace experience encountered at the modern day strip mall is not what you’ll find in Santa Fe. Instead, you’ll find a collection of local, independently owned shops populating our storefronts, each as unique and fascinating as their owners. We’re confident that you’ll find what you’re looking for, but we’re also pretty sure you’ll find things you didn’t even know you were looking for, including jewelry, clothing, hand tooled cowboy boots, handmade furniture, handwoven rugs, Native American pottery, a variety of art, home décor, specialty foods, books, and so much more. Two of Santa Fe’s most popular shopping destinations are the Santa Fe Plaza and the Railyard District. Canyon Road is also a great place to find numerous art galleries, jewelry, leather goods, imported gift items and even great restaurants to keep you fueled up. One of Santa Fe’s best kept shopping secrets are the spectacular gift shops found at local museums. There are a total of 8 of these shops, all unique, and they carry everything from apparel, furnishings, jewelry, accessories, music, movies, and Native American art. Our favorite shops include those found at the Museum of International Folk Art, the New Mexico Museum of Art Shop, the shop at the New Mexico Museum of Indian Arts and Culture, the Speigelberg Shop at the New Mexico History Museum, and the shop at the Palace of the Governors. Though there are times where the shopping in Santa Fe can feel out of reach, there truly is something here for everyone. Just as Santa Fe is a Mecca for those with an eye for objects both elegant and unusual, so too is it a Mecca for those in search of great bargains and finds at the area’s many consignment shops. Our favorite consignment shops include Double Take, The Beat Goes On, Real Deal Collection, and Act 2. Join us for a shopping adventure, when you book your room at our luxury Santa Fe Bed and Breakfast today.